Summer 2019 is here and one of the most fun things to do in warm weather is dunking over a friend on a pool bball hoop. Pool basketball is a game any baller can play with the right equipment. In this review, we’ll rank the best pool basketball hoops on the market to choose from, as well as two to avoid. You’ll also see info on popular brands to consider and details that are important when purchasing a pool bball hoop. Pool Side vs Floating Pool Hoop? Lifetime 1306 Pool Side Height Adjustable Portable Basketball System, 44 Inch Backboard Review: Lifetime is a fantastic basketball hoop system brand. Pool Basketball system is no different; this pool basketball hoop will make you feel like you’re on a court. With a 44” shatterproof Polyurethane backboard, this hoop is much bigger than most pool hoops and has a height adjustment from 4.1 feet to 7 feet. This Lifetime hoop is pricier than most pool basketball system but with a sturdy backboard, portable, a quality 27-gallon base and a solid steel rim as well as a five-year manufacturing warranty, this basketball hoop is exactly what you want at every summer pool party. Pool Basketball Hoop by Pool Shot – Wing-It Review: This Wing-It pool basketball hoop is very different and is one of the best hoops that you can look for. Wing-It has built a portable pool basketball hoop that is perfect for a summer hangout. The backboard on this hoop is very unique; it has a UV resistant winged backboard which gives it a unique rebounding experience. Its base has an anti-tumbling design which is one of the most important features to have with a pool hoop, stability is critical. The base is also good to be outside all year round as it is immune to all weather elements, this hoop may be a little more expense than the usual pool basketball hoop but this is more than a standard pool hoop, this is top quality. Dunnrite Splash and Shoot Swimming Pool Basketball Hoop with Stainless Steel Rim Review: Dunnrite makes great pool basketball hoops and is one of the top brands when looking for pool hoops. 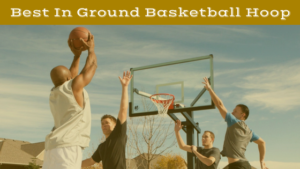 This hoop has a height adjustment up to 5 feet and has an unyielding base that will allow for some dunks and more of intense action and provides a net that is all weather resistant. The base is The super-tough that stacks up with a 40-inch width, 24inch long, and 10 inches high and holds 25 gallons of water which make the base weigh 200 pounds when completely filled. The vinyl coated steel rim makes the rim rust resistive and also gives the hoop an extra bouncy action. Swimline 9162 Super Hoops Floating Basketball Game Review: The best floating basketball hoop out there, excellent quality with a PVC fluted tubing that gives this ideal durability and strength. The net is extremely durable, and this set also comes with a basketball that is much better quality than most of the basketball that is provided with basketball systems. It’s very light, weighing only 2.6 pounds which mean it can be a great portable game for children as well as adults. Assembly is incredibly easy and shouldn’t take more a few minutes to set up and be ready to dunking on friends in the comfort of a pool. It’s hard to beat this basketball hoop for the price that it is at. Dunnrite PoolSport Swimming Pool Basketball Hoop with 13.5-inch Stainless Steel Rim Review: Dunnrite just make terrific pool basketball hoops and if you are looking for a well known and quality brand, go with either Dunnrite or Lifetime if it’s a poolside basketball hoop you have your heart set on. This hoop is the perfect mid-size hoop that allows you to have a sturdy basketball hoop with a great and solid backboard but still gives you the portability to take it from pool to pool or pool to home. 31 inch by 22-inch Polyurethane backboard and a steel rim that hangs 4 feet above the deck to give it a real game feel to it. 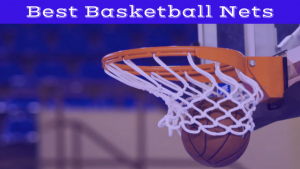 Cool Jam Pro Basketball Net and Backboard Review: This poolside basketball hoop is a durable and long lasting hoop that can be a quality hoop for your pool for years to come. A useful height adjustment features give this hoop the quality and real life feel to play with friends or for children spending time in the pool. The backboard is incredibly wide at 44 inches wide and 32 inches high, so there shouldn’t be any need of missing the shot so bad you have to get out of the pool to get the ball. It’s not exactly a cheap hoop, but it is a respectable price for what you are getting, this hoop is certainly one I would recommend considering. Lifetime 1301 Poolside Basketball System Review: Lifetime comes with another great poolside basketball hoop as they usually do with standard basketball hoops. This Lifetime hoop is extremely good for the price with features such as a 44-inch Polyurethane backboard that is incredibly sturdy similar to the top-rated Lifetime hoop. Luckily, this hoop is rust resistant, so there is no concern of this hoop wearing down in a few years. This is not a hoop is necessarily hang on, though it has a sturdy base, that doesn’t mean that you can’t still dunk on this hoop, just don’t hang unless you want it tumbling down on yourself. 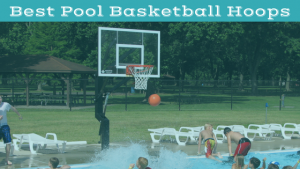 SwimWays Poolside Basketball Review: This poolside basketball hoop is great for kids and families to use while having fun on a relaxing summer weekend. It has a heavy-duty backboard, so the kids can have as much fun with it as they want and have a sturdy base that will relieve buyers that their kids won’t hurt themselves when playing with the pool hoop. The hoop is also very light, so the portability is top notch and is insanely easy assembly so there will be no frustration in setting it up. Just open it up and put it in the pool and have some summer fun. Aosom Height Adjustable Portable Poolside Basketball Hoop Review: Though the qualities of this pool basketball hoop seem fine, the customer reviews have been terrible, and the brand is not up to par compared to the likes of Lifetime, Dunnrite and Swimline. For the price of this basketball hoop, you can find pool hoops on this list that are very close to the same price or cheaper that are much better qualities and give unique features that will make the game more fun and intriguing. Always make sure you see what customers say about this product and when the reviews are things like “missing pieces” or “no directions” or when the product is considered higher than what it actually is, stay away from it. Aqua Leisure Basketball Slam Dunk Game Review: This basketball hoop is one that I would highly recommend staying away from because of the quality of the product. Quality and durability are things that I would stress as maybe the most important thing to consider when buying a pool hoop and when a product doesn’t have those qualities, why buy it. This hoop will not last you very long as many customer service reviews will tell you, though it is at a low price, it also is just pumped with air and will not be something you want to consider when you can find quality pool hoops on this list at very close to the same price. Dunnrite: Dunnrite as a brand rarely have complaints with their products. Providing reliable, sturdy hoops that have unique designs give them something above the rest when you are looking for pool hoops. Most of their products have height adjustment features so their product can be perfect for adults and kids as well as portability aspect that makes it easy to move when water is not in the base but can hold a ton of water that when playing with their hoops, you can dunk and allow an intense game to ensue while relaxing in the sun and the comfort of a pool. Lifetime: Lifetime makes arguably the best basketball hoops no matter if it is a standard basketball court hoop or a poolside hoop. The quality and price of the hoops are extremely hard to beat, and most of the thousands of customer service reviews of their products are about how great and reliable their product. You will not feel like you were cheated out of your money with Lifetime products. If that isn’t enough for you to feel comfortable, for most of their products including the ones I have provided, they have a five year warranty, that is confidence in your product. Swimline: Swimline is one of the top brands in providing floating hoops. If you are looking to have a game while swimming around the pool, look for hoops in this brand. Long lasting and durable with a quality net is all you can ask for in these floating hoops, and Swimline gives you all those qualities. The nets are very durable and usually are very light and portable hoops that make sure that their products are assembled quite easily, no frustration is needed. The price is very low and when looking at the cheaper products, this is one of the brands that can make you feel comfort with. Swimways: Lastly, Swimways gives high-quality portable pool hoops at a very low cost. 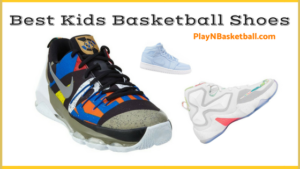 You want to have the super sturdy base or a top quality backboard, but they will provide you with the essentials to play a fun game of basketball and provide the necessary durability that makes customers feel customers comfortable with purchasing their products. One of the cheaper options when it comes to poolside hoops, it is difficult to find something better when comparing it to the products of the same price, and with the high customer reviews that they have, Swimways is one of the best brands of pool hoops you can get. When purchasing one of the best pool basketball hoops consider how you want to play, which will determine whether to get a poolside or floating hoop. Another thing to think about is the durability of the system and if you want to get something that you can use for a three on three games such as a Lifetime hoop or maybe something smaller to play one vs one. Durability: One of the main factors to consider when buying a hoop is durability. Make sure that, like buying one of the best basketball hoops for use in the driveway, your pool hoop is going to last years. Make sure the net and backboard are resistant to weather conditions, and the hoop won’t rust as a lot of pool hoop do, this is very important. Portability: The factor of if you want it to be portable may depend on location, if you are buying a hoop to take to a pool and play a few games, then you might want to consider a hoop that is more portable. If you are looking for a hoop to set up at your house, then something that you can keep outside seems more worth it. Price: Certainly price is a factor in just about everything and pool hoops are no different. 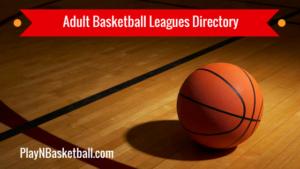 You want to get as much as you can for the money you are willing to spend so remember that there are hoops on this list for all ranges of prices and you can kind something whether you are looking to spend just as little as possible or several hundred dollars. Floating: Floating basketball hoops are great if you are looking for a system that you can play with while swimming around and having a laid back time. It is also a terrific hoop to get for young kids who can use the hoop to learn to play the game and can spend time at the pool swimming as well. Poolside: The poolside basketball hoops have a base that will allow you to play more of a real style with a backboard that will allow for rebounds and dunk. This is better for teens or adults to use. When looking for your new pool basketball hoop make sure you take into consideration factors like portability, durability, safety, the price and the brand that you are buying it from. Make sure to know what kind of hoop you want, so when you do purchase the hoop, it is all about relaxing, enjoying the game and hopefully not getting dunked on too hard.